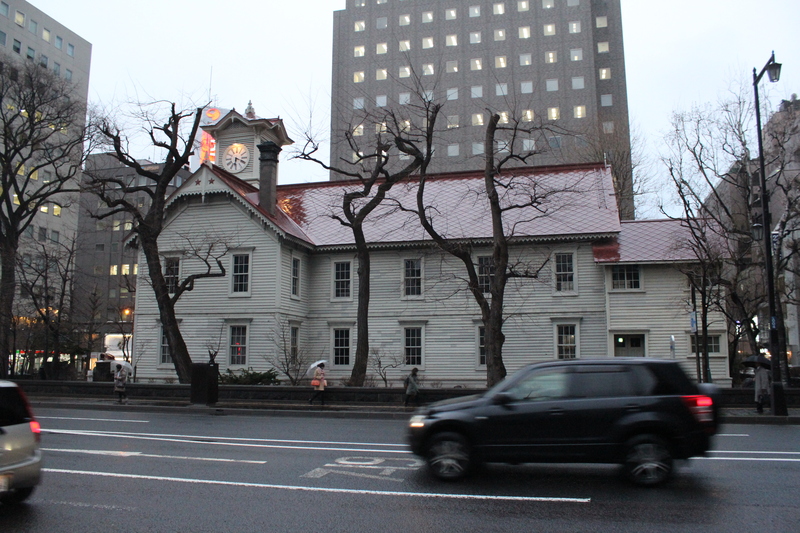 We leave Hakodate in drizzle that soon turns to serious rain, cold rain too as the car’s thermometer reads 4 degrees outside. Retracing our route down the coast road for a way we are amazed the crab, salmon and bear roadhouse that we saw yesterday with clear blue sky is now barely (sorry) visible through the gloom. 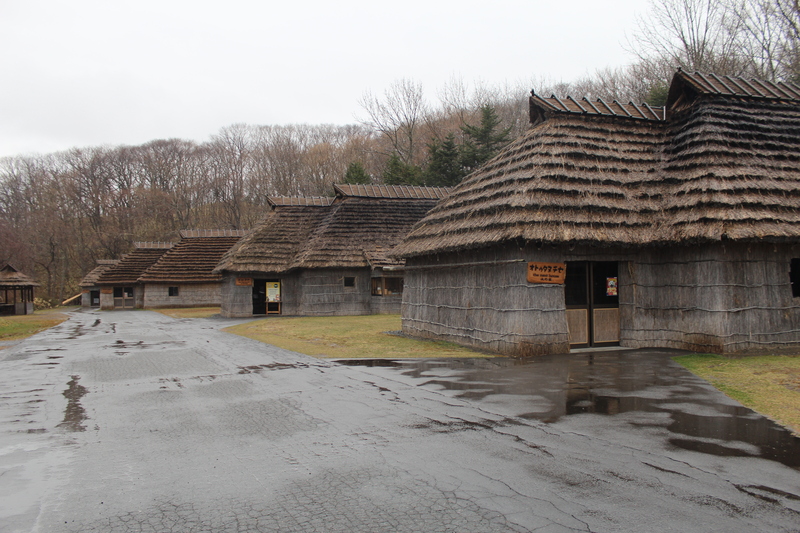 However the Porotokan Ainu outdoor museum will give us insights into the lengthy passages in A Wild Sheep Chase that Murakami devotes to the establishment of Ainu people in Hokkaido in the 1850s after their expulsion from Sakhalin Island which has switched between Japanese and Russian ownership almost as often as Alsace has between French and German. Umbrellas to the fore we visit the village houses, look at food storage huts, birch whittling and bear cages – bears were sacred and young ones were kept in the village for a year and then sacrificed to the gods. 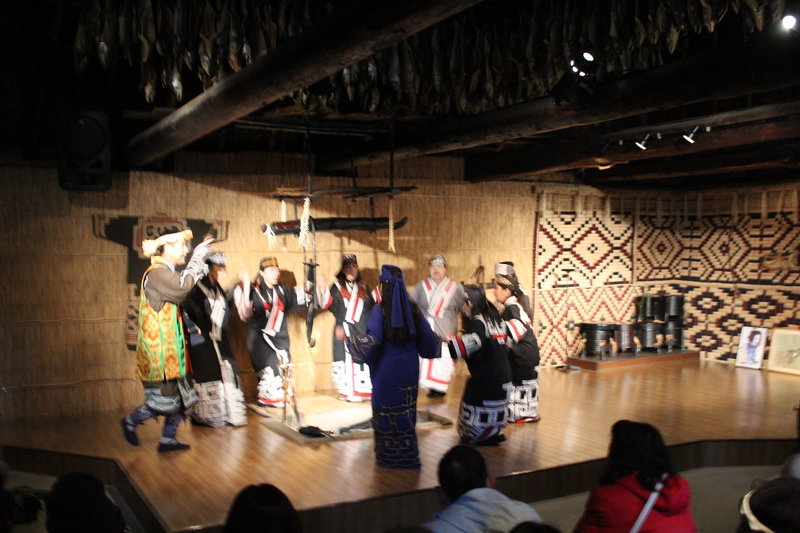 We are then alerted to a performance of traditional Ainu song and dance and music performed on a three stringed shimosen-like instrument and amazingly on a mouth operated sort of Jew’s harp. Delivered in Japanese and interpreted for a coach party of Chinese, it was nonetheless an interesting and moving experience showing links with other peoples of extreme northern climes all around the north pole. The dance they then performed has been recognized by UNESCO as an intangible cultural asset and it was a stunning display signifying the sending of the bear’s spirit to the gods. On their clothes and in museum vitrines, the intricate patterns of their embroidery were a joy to behold and their versatility in using whatever materials they found was equally impressive. 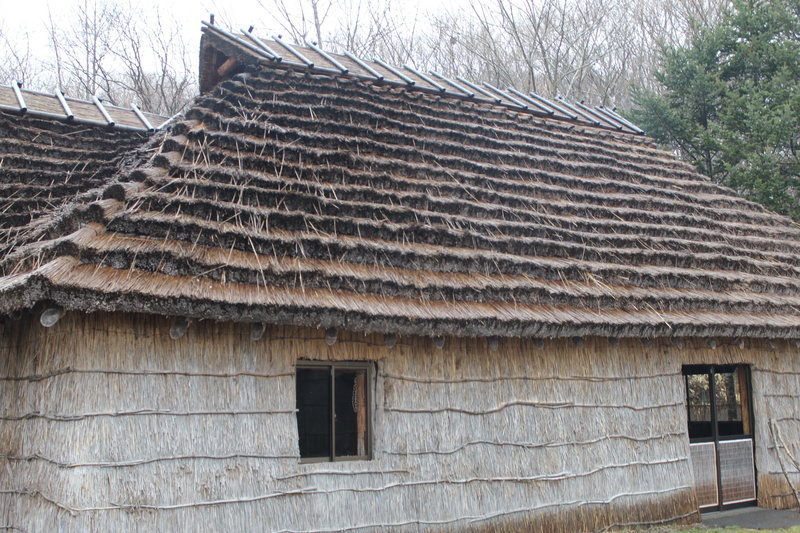 The Ainu youth telling his story in A Wild Sheep Chase means a lot more to us now that we understand more of the cultural and historical background of this minority. 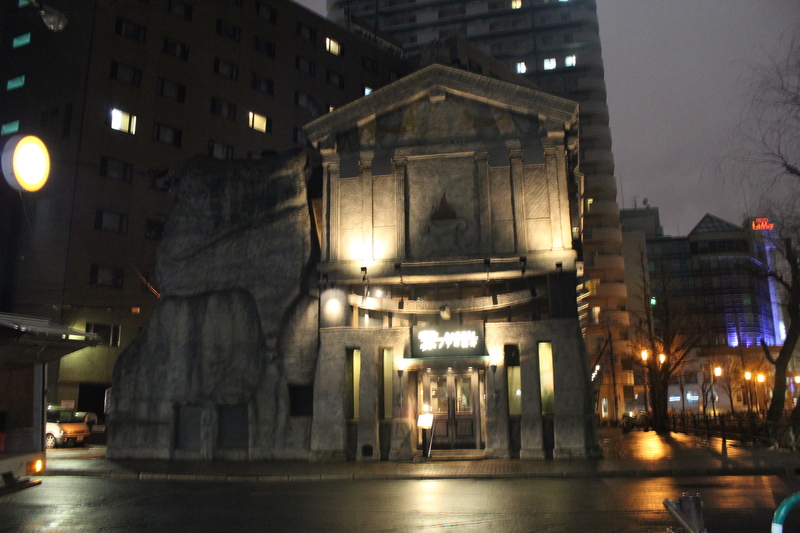 Then it was time to hit the road for Sapporo, another important location in the same book and its sequel Dance, dance dance. 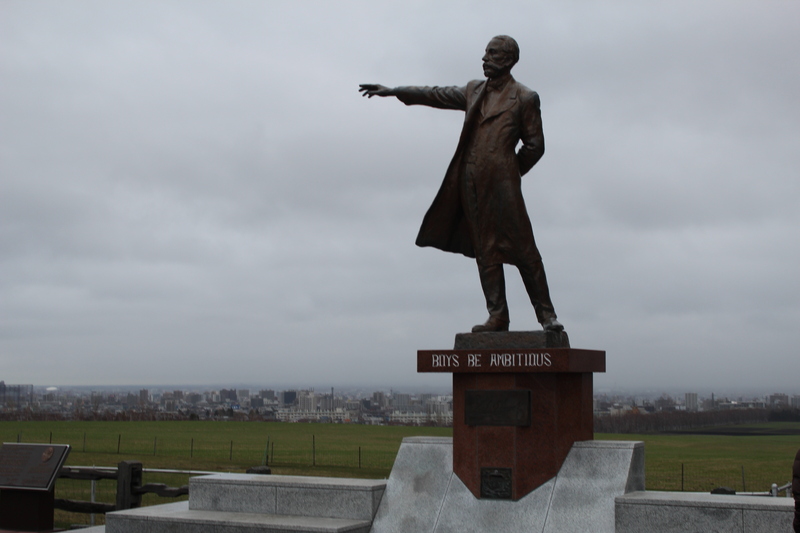 On the way in we diverted to the Hitsujigaoka Observation Hill from which you can overlook the city, the Sapporo Dome – one of the FIFA World Cup in 2002 and look at the statue of William Smith Clark with its admonition “Boys be ambitious” a motto we send to Vicarage Road to our boys for Saturday. 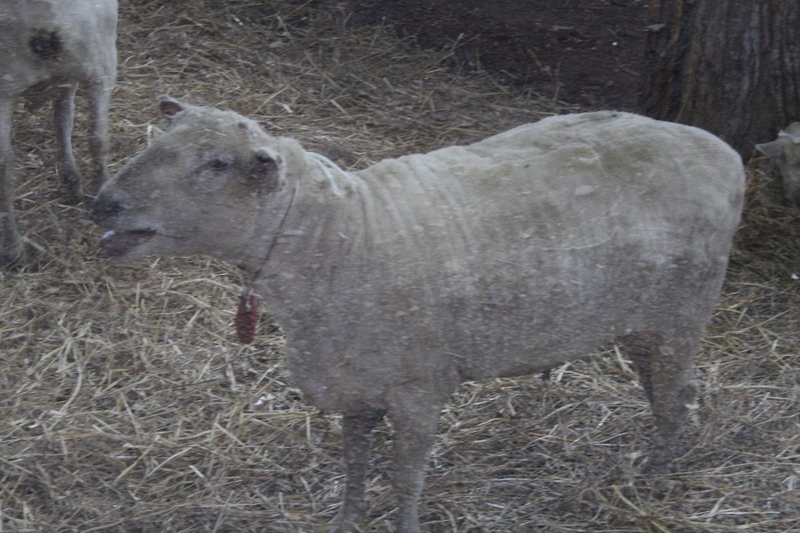 Supposedly sheep graze on the slopes of the hill but it was so cold and wet that they were in a stable, if sheep can be in a stable. We had come to Hokkaido to chase wild sheep and we’d found some tamely indoors. However it counts as some sort of result. At least it’s going “baa!” at us as if wild. 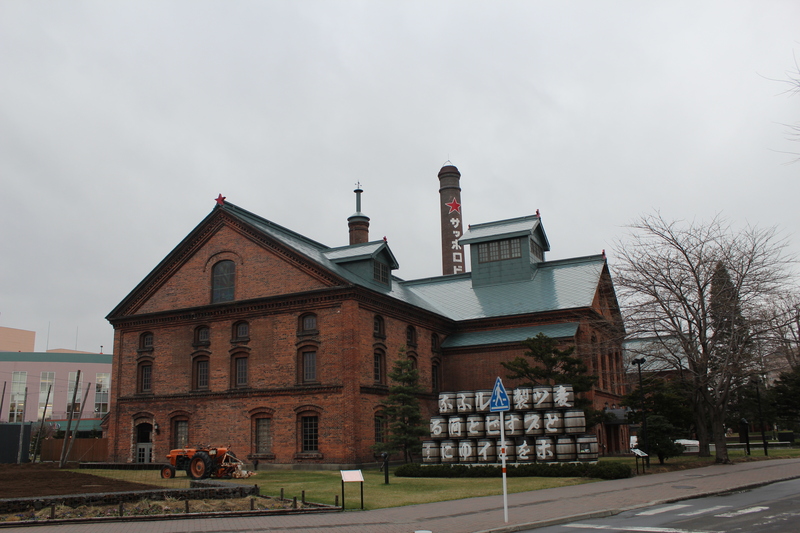 Heavy rain on our departure led to the usual choice – aquarium or Sapporo brewery tour. This time we were thwarted though as the brewery tour was closed because Monday had been ‘Greenery Day’ and it closes the day after public holidays. 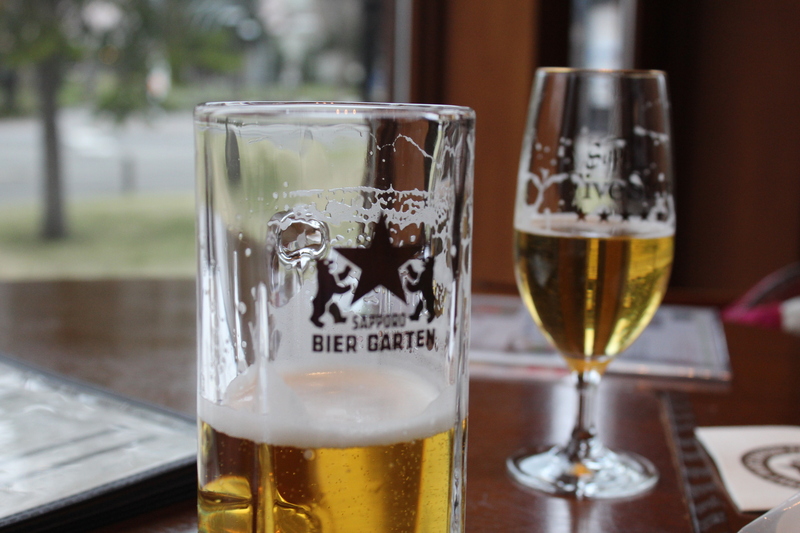 However a beer hall was available and wares could be purchased. 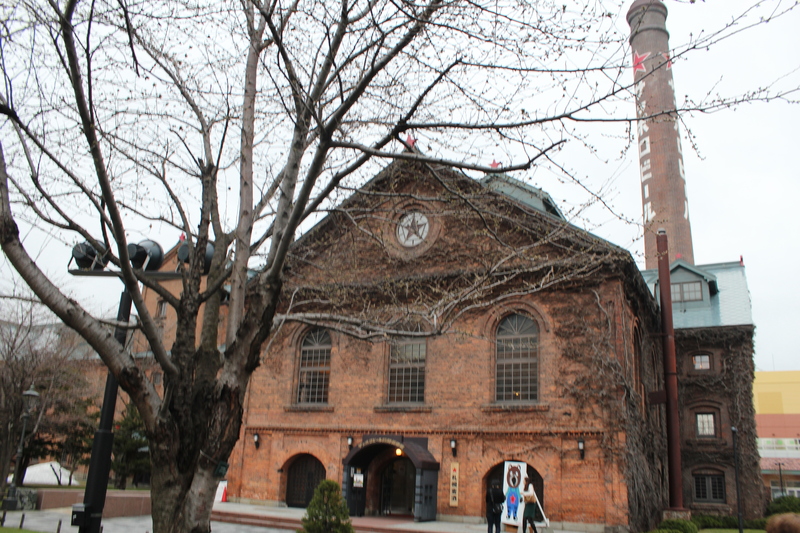 It’s a great building and would have been fun but downtown Sapporo calls as another important location in both books. Whoops again with SatNav Lady taking us 5 km out of town to a suburban residential street based on the hotel phone number – obviously a digit wrong somewhere. Fortunately we were equipped with our precious atlas and a Sapporo map we’d brought from the UK so we were eventually able to get to the hotel, check in and go looking for various sites with a degree of success. When we’d had enough we found ourselves at a restaurant called L’arc de Noe. After the rain we’d been through today where more appropriate to eat than in Noah’s Ark? It’s an incredible building designed by British architect Nigel Coates and serves food grilled over charcoal at your table. 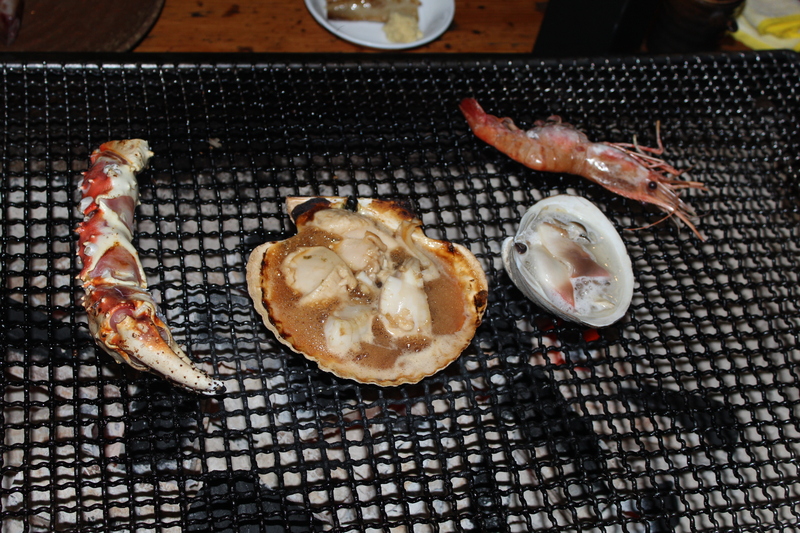 Crab, prawns, scallops, various fish for which we now have the Latin names and finally some beef. They also had local Hokkaido wine made by the agricultural department of Hokkaido University in Furano. It took a little while to get some air to it but ended up being most acceptable. 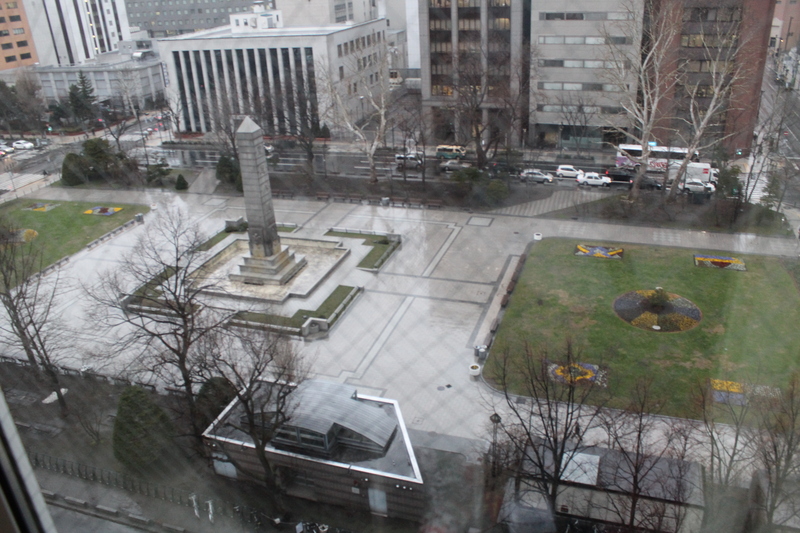 We took the subway back to the centre of Sapporo, took in a bit more of the now less damp atmosphere of the city and retired ahead of a drive north tomorrow in search of wild sheep.